Our favorite review of the current tour! Thanks to Harold Lepidus and the Bob Dylan Examiner for allowing us to share this insightful and engaging review of Bob on his Fall 2014 tour of the US! I usually use the light from my phone to help jot down notes when attending concerts I expect to review, and told the closest usher about it. He said he didn’t mind, but advised me to just keep the light out of sight. As I sat in my seat, waiting for the 8:00 (prompt) start, I decided I wouldn’t even bother. Remembering Hitchcock’s words, I would live in the moment, and experience the show fully engaged, without the distraction of chronicling the performance. This was also my first show since the publication of David Kinney’s “Dylanologists" book, so maybe that had an effect as well. Certainly, the set list would not have to be written down. Things have been holding steady in that department for most of the tour, with only a few changes in the past year or so. While some have complained about the static set lists of late, I embraced them. At least on paper (or the computer screen), it looked like a play, a Shakespearean musical, “West Side Story” … Dylan style. In my 2013 birthday tribute, I pointed out the connection between Dylan’s latest studio album, “Tempest,” and Jerry Lee Lewis’ rocking version of “Othello,” which was featured in two consecutive episodes of Dylan’s “Theme Time Radio Hour” radio program. The brutal, ugly, uncompromising material from “Tempest,” full of murder, betrayal, lust, tragedy, and mortality, was perfect for the stage. Why do I think these songs were Shakespeare inspired? Because Dylan said otherwise. 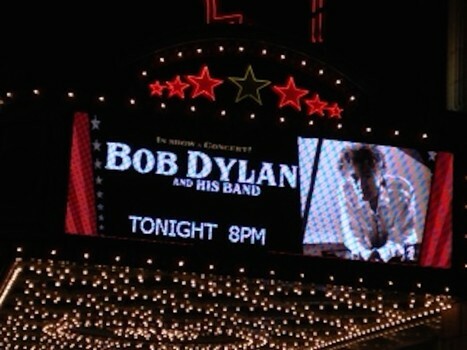 It is interesting Dylan chose to play Broadway-sized theaters on this tour. The majestic surroundings of the PPAC were perfect for Dylan to tell his tale. The show was no rock opera, mind you. It was a series of vignettes, tale after tale of love, loss, disappointment, revenge, death, regret, survival. One of the benefits of playing the same songs night after night was a very tight performance from Dylan’s band members - Charlie Sexton and Stu Kimball, bassist Tony Garnier, drummer George Recile, and multi-instrumentalist Donnie Herron. The arrangements had a bit of a lilt, with most songs played at a slightly more frantic tempo than the originals. If this concert was as bleak as the original recordings, people might be tempted to open a vein after the final number. But what about the performance? It was as if time and space collapsed upon itself. The venue itself, originally built in 1928 as a movie theater, lent an opulent charm, and Dylan, a survivor of the 1960s, was no Peter Pan. He was decked out in his usual stage attire - this time a black-with-white-trim suit and cowboy hat - and appeared as if he had emerged from a bygone era. If you’re a fan, you know the songs he sang, and you know what happened, with Dylan alternating between singing center stage and playing the piano stage left. What was not immediately obvious, however, was that Dylan had become a crooner. A crooner, you say? Well, maybe not in the traditional sense. After all, he was fronting a rock and roll version of a cowboy band. Dylan has shed his past and most of his old songs, one more layer of skin gone. The folk-rocking so-called ex-spokesman of a generation was now 50-plus years down the road, deep inside his new songs, deep inside himself, with a comfort and grace which belied his 73 years, his art and his life completely intertwined. Sure, his voice was rough around the edges, but it was clear and full of power, and, when needed, sensitivity. Novices might have been dismayed by what they saw, but anyone following Dylan’s five decade journey knew what to expect. Then there’s that voice, the one that has been mocked by some since day one. Yet Dylan has mastered the phrasing, and feeling, to convey passions and emotions as no one else ever has. It’s rough, but it’s been rougher. You don’t live the life Dylan’s led, or drink the drinks or smoke the smokes or think the thoughts he has, and expect soft and comforting dulcet tones. It’s real, and it connects. It’s not pretty, yet it’s beautiful. It takes no prisoners. Who else could sing about killing a man in Paradise, and make it seem so matter-of-fact? Dylan sang with ease, and like Mick Jagger, can still command a stage. The most interesting performance was the final number, a cover of “Stay With Me,” notably covered by Frank Sinatra late in 1963, around the time Dylan was recording “The Times, They Are A-Changin’.” When Elvis Presley, the last of his original major influences after Hank Williams, Buddy Holly, and Woody Guthrie, died at the age of 42 in 1977, Dylan was going through the dissolution of his first marriage and editing his four-hour film, “Renaldo and Clara.” It was not a very good year. His next tour, in 1978, was not unlike Presley’s Las Vegas shows from the last decade of his life. Over his next decade, Dylan tried a myriad of styles, but finally found a new model in 1987, fashioned after the Grateful Dead’s improvisational, never repeated, non-conformist shows, which have evolved over the past quarter of a century. For an artist as restless as Dylan, even constant change can get stale. To fans, it was about what songs he played, not how he played them. Dylan’s next album is rumored to be a collection of songs made famous by Sinatra. After the initial reaction of “What the hell?,” it began to make sense. Who else could Dylan use as a role model at this stage? Certainly no rock-and-roller. When I thought of Sinatra’s later years, my memory played tricks on me. Sinatra was Dylan’s current age in 1988, back when Dylan started the so-called “Never Ending Tour.” After watching some of footage online, it was clear Ol’ Blue Eyes still had that late stage, scotch-and-whisky smoothness in his voice. It can be interpreted that Dylan is doing his own unique take on the lounge singer act. He was channeling Sinatra, Chevalier, even Leonard Cohen. Once again, he has transcended time, and brought the past into the present, and vice versa. However, this could only be concocted in the mind of one Bob Dylan. It doesn’t follow the regular path. Besides, when has Dylan ever done that, except under protest? The most recent incarnation of Bob Dylan is dignified, which may be why he does not allow photography, as he stares down his own mortality, traveling full speed ahead, not paying attention to the warning sings or speed limits. As David Byrne once sang with Talking Heads, “You may ask yourself, how did I get here?” For many, it is surprising Dylan made it this far, but critics and fans appear to be catching up with music’s most adventurous time traveler. Once again, he’s doing it his way. Like Sinatra, he’s been counted out so many times, only to reinvent himself. It makes sense. From one Ol’ Blue Eyes to another. The February release of “Shadows in the Night” cannot arrive soon enough.